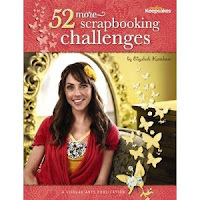 Authored by the Creating Keepsakes' Scrapbooker of the Year, Elizabeth Kartchner, 52 More Scrapbooking Challenges is a great book for sparking your creativity! As the title suggests, there are 52 challenges in this edition to stretch and inspire you. The challenges are divided into 8 sections and each challenge features two sample layouts to give you examples of how to execute the challenge effectively. These sample layouts come from an all-star list of talented scrap artists including the author herself, Amanda Johnson, Beth Opel, Cindy Tobey, Keisha Campbell, Kelly Purkey, Mou Saha, Sasha Farina, Shelley Aldrich, and Sheri Reguly. This section gives several examples of how to let yourself be inspired by the everyday things around you such as fashion to CD covers. Two of my favorite aspects of this craft, Kartchner offers innovative ways to design "in the round" and to go monochromatic without going stale. Don't let those 'old' supplies go unused! Kartchner shows how you can successfully marry old products with new for a dynamic layout. Also in this section, she shows you to go beyond the product to even using product packaging in creative ways. How about using a beautiful note card for hidden journaling or sheet music to create accents? This chapter features layouts examples for these great ideas and more. For many, this is the hardest part of scrapbooking, but Kartchner offers several ways to make it simple and spice things up at the same time such as using quizzes and custom Mad Libs to tell the story. In this section, you'll discover all-new ways to use basic supplies such as glue and innovative ways to construct handmade embellishments. Kartchner encourages one not to be afraid to write directly on a photo or use a enlarged photo as the background of a layout. Also included in the book are segments entitled "Quiz," "Lizzy's Last Word" and "Try This." There is a quiz featured at the end of each section to help you learn more about your own creative process in relation to the topic covered in that particular section. Some of these quizzes would even make great journaling for a layout about your own creative process. Lizzy's Last Word is also featured at the end of each chapter with additional tips and advice from the author specifically related to the topic of that section. The Try This segments are scattered throughout the book - 14 in all - and include detailed step-by-step instructions for techniques featured in various sample layouts in the book. All in all, I was quite impressed with this book and hope to be trying a few of the ideas included myself soon. Have you read this book? If so, what did you think? What was your favorite challenge featured in the book?